Clint Eastwood's directorial debut, Play Misty For Me just gets better with the passing years. The Hitchcockian psychological suspense thriller features one of Eastwood's better acting performances, and mounting tension in a journey to the depths of destructive obsession. In the small town of Carmel, California, Dave Garver (Eastwood) is the overnight jazz disc jockey. A bachelor and ladies man, Dave has a regular mysterious caller who always requests that he play Erroll Garner's jazz classic Misty for her. Dave meets Evelyn (Jessica Walter) at the local bar, realizes that she is the regular caller, and they have a one-night stand. Dave wants to try and settle down with former girlfriend Tobie (Donna Mills), an artist who has returned to town after a few months away. But Evelyn has other ideas. She starts to stalk Dave, showing up unannounced, demanding that he spend time with her, gradually becoming more persistent and less rational. When Dave rebuffs Evelyn and makes it clear that he has no interest in her, she turns to more serious threats and outright violence. 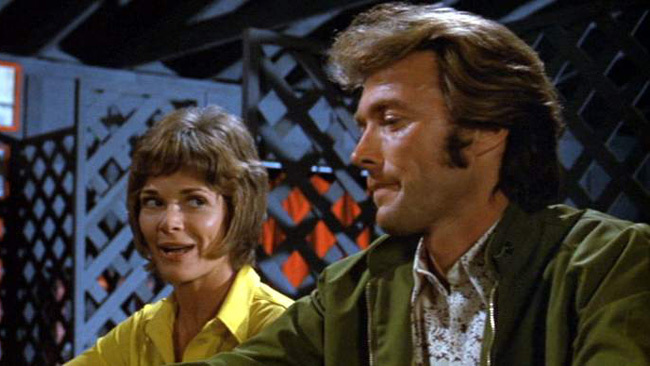 Delivered for a budget of less than $800,000, Play Misty For Me established Eastwood's reputation as an efficient director who wrapped up productions ahead of time without sacrificing quality. The film does, however, contains perhaps a few too many showy moments, Eastwood the director having almost too much fun with the new toys available to him behind the camera. Making the most of the Carmel locations (Eastwood's home town), there are scenic sunsets, large waves, and walks along lush trails and on the idyllic beach, all stylishly captured. Indoors, once the horror kicks in there is plenty of screaming, and many tight shots of horrified or crazed eyes. In other examples of marginal over-enthusiasm, there is a jazz festival sequence cleverly filmed in documentary style but almost out of place in this film, while the romantic montage scene featuring Dave and Tobie falling in love again to Roberta Flack's The First Time Ever I Saw Your Face is a beautifully shot interlude which intentionally diffuses the tension and manages to disrupt the rhythm of the movie. The overall impact is of an undoubtedly talented director injecting plenty of interesting touches but leaning towards showcasing his own emerging talent. The two lead performances are excellent. Dave Garver is one of Eastwood's few role in which he is a non-violent man and primarily a victim. 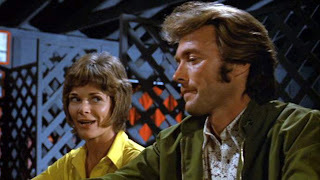 Suddenly, Eastwood has to act, and he surprises by capturing a confident man quite helpless as his world disintegrates. 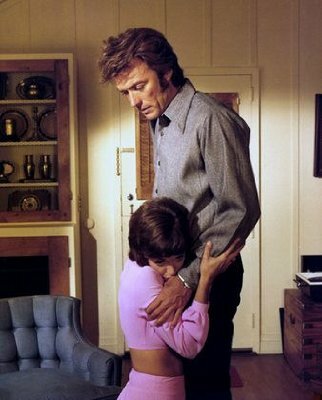 Evelyn's psychological overload overwhelms Dave's defences and he succumbs to her pleas and threats, taking Eastwood to emotionally vulnerable places that he rarely visited on film before or since. In a role that defined her career, Jessica Walter created a memorably disturbed woman. Evelyn is convinced that she has to win Dave's unwavering affection or life is not worth living for either of them, and that warped lens firmly frames her actions. In several scenes Walter is terrifyingly unstable as she switches from dangerous aggressor to pleading lover without breaking her stride, transformations that point to a sick mind frantically seeking any form of remedy. Sixteen years later, Fatal Attraction essentially remade the same story and became a global phenomenon. Play Misty For Me is a less glamorous movie, but also a more organic and intimately threatening experience.